https://matcha-jp.com/en/5813 Make Delicious Taiyaki For Yourself At GURAKU In Asakusa! Make Delicious Taiyaki For Yourself At GURAKU In Asakusa! Taiyaki is delicious traditional Japanese pastry. Many may have tried it before, but there are probably few that have made it themselves. How about making your own taiyaki at GURAKU in Asakusa! MATCHA's readers receive a discount! Taiyaki, a sweet that consists of anko (sweet red bean paste) sandwiched inside wheat flour dough, is a type of wagashi (traditional Japanese sweet) that is truly representative of Japan. This sweet is often sold at street stalls, so there may be many of you who have tried it before. The sweet red bean paste and dough match so well together that it'll surely make you want more. By the way, has anyone ever thought about how taiyaki are made? Or how would taiyaki made by yourself taste like? We have great news for you! There is a shop in Asakusa where you can experience making taiyaki yourself. Its name is ASAKUSA TAIYAKI GURAKU. The characters for “guraku” mean “enjoyment” and “desire”. The Japanese pronunciation of the word is also similar to “good luck” in English, making this a name that has had various thoughts and feelings put into it. Immediately following its opening in January 2018, this taiyaki shop became a hot topic for not only being delicious, but for also being a place where you can enjoy a Japanese culture experience. Our MATCHA writer visited the shop to take a look into its popularity. This is what the exterior of GURAKU, located an eight minute walk from Asakusa Station on the Tokyo Metro Line, looks like. The entrance is reminiscent of a red-themed shrine. When you take a step inside, you will see a large sign with GURAKU written on it. The red Japanese lanterns are quite beautiful! The shop interior immediately past the entryway has noren curtains and wagasa (Japanese umbrella) lights that come together to create a truly Japanese atmosphere. Customers that will only be purchasing taiyaki are to make their orders here. You will find an experience space for making taiyaki upon passing under the inner curtains. This room is very Japanese-like and is decorated with ukiyo-e (woodblock prints), swords, as well as a small garden on the opposite side of the room pictured above. It is a very fun and cozy space thanks to the playfulness of the staff. Without further ado, let’s make taiyaki ourselves! You will first watch a five minute video and learn how taiyaki are made. You will also learn about the history of taiyaki, so it will be quite the learning experience. This video is available in English as well as in Japanese with Chinese subtitles, so international customers need not worry. Add water to the flour batter and carefully mix the batter until the lumps are gone. *1 Chakkiri: a tool for pouring flour batter onto (taiyaki) griddles. Next, you will prepare the red bean paste. You will place the appropriate amount of red bean paste onto the bean paste server to match the scale. The amount of red bean paste measured out at this time will be the same amount that is put into your taiyaki, so be sure to measure it out carefully. Finally, you’ll pour the batter into the taiyaki maker! 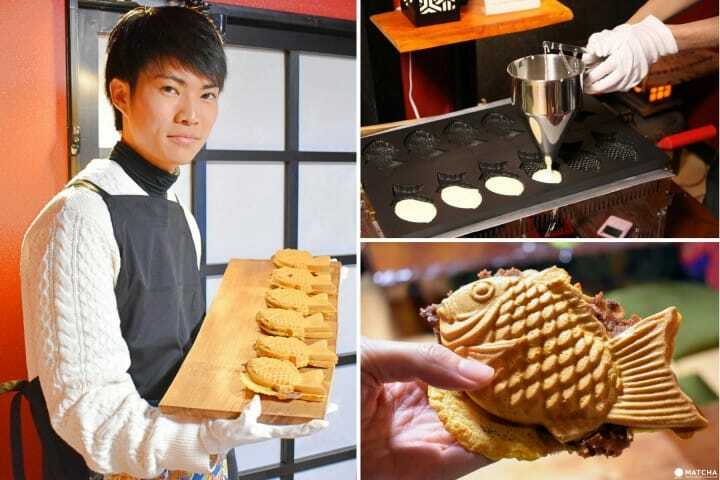 Six pieces of taiyaki can be made at one time with this maker. First, pour the batter into the deeper grooves of the taiyaki molds. When looking closely, the grooves on the molds in front of you will be just a bit deeper. That’s because this is the side that you will be placing the red bean paste on. The batter will end up solidifying if you work too slowly, so let’s move quickly. The trick is to roughly fill in one third of the mold with batter. Use a spatula to place the red bean paste you prepared a little while ago on top of the batter. It went well! The trick is to also roughly fill one third of the mold with batter on this side. 7. Join the Two Sides Together! At the right time, join the two sides together. The iron plate will be heavier than you think it is, so be sure to put your strength into joining the two sides together! It’ll become easy if you think about how this weight will lead to the delicious taste of freshly made taiyaki. After waiting two minutes, open the iron plate and you will have perfectly browned taiyaki. It’s finally done! It ended up overflowing a bit on the sides, but our writer thinks it went quite well if he says so himself! 9. Let's Taste the Taiyaki! Now, it’s time to taste our taiyaki! When our writer tried the taiyaki he made, the exquisite flavor of the springy dough melded into the piping hot red bean paste. Our writer became quite fond of taiyaki after trying to make them himself! Approximately one hour is required for the taiyaki-making experience. You can make a reservation on the experience plan page of their official website. The experience fee is 3500 yen for adults, 2800 yen for students (both without tax; comes with one soft drink), and free for preschool children. At GURAKU, there are an assortment of ingredients, from the standard to unconventional, available for use. For example, the ingredients for this taiyaki, to our surprise, are bacon and egg! Taiyaki don't just have to be sweet to be delicious! The solid flavor of the bacon and the soft-boiled egg go mysteriously well with the taiyaki batter. It’s a meal that seems like it’d also be perfect for breakfast. Customers who participate in the experience can also use ingredients they’ve brought themselves at their own risk, so you can also get creative with your own custom taiyaki. Doesn’t that sound exciting!? By the way, we were told that a staff member of GURAKU has attempted using actual sea bream sashimi as an ingredient. They said, “It was delicious, but it might be (more) delicious if I develop the flavor a little more and get rid of the fishiness…” and resolved to attempt it again. Sakura-an (cherry blossom red bean paste) is scheduled to be added as an ingredient starting from April to match the season. GURAKU is also easily accessible for international tourists because of its location in Asakusa. The videos and menus are available in English and Chinese, so tourists can readily visit the shop. It is a very fun place where you can experience Japan itself. The wall inside has both a map of Japan and a world map where you will see where each customer has traveled from. It has only been a month since the shop opened, but they already had visitors from all over the world! We were told that their goal is to conquer the world map by the time of the Olympics. This photo is of the staff at GURAKU who gave their cooperation for our shoot. To the left is Mr. Hayashi, in charge of public relations, and to the right is manager Mr. Fujino. “I believe that we’re the first shop in the world where you can experience making taiyaki yourself. Everyone, please come to GURAKU and make taiyaki!” (Mr. Hayashi). Price Taiyaki-making experience: Adults 3,500 yen, Students 2,800 yen (both without tax. Includes one soft drink), free for preschool children / Taiyaki-only starts from 190 yen.